Teeth Whitening Products Put to the Test. Did They Work? When you turn on your local news and notice how the evening anchors’ teeth seem to glow like street lamps, you think to yourself, “I want my teeth to look like that.” So, that launches you on a quest to find a way to whiten your teeth in the safest and most effective manner. Should you make a trip to your local grocery store or to your dentist for professional teeth whitening? Your dentist in Jacksonville provides some comparisons to help you make the right decision. Whitening toothpastes can effectively remove surface stains, like those from soda, coffee and cigarettes, but can’t change the natural tooth color, since that requires them to reach the deeper dentin layer. A stronger method is needed to address anything beyond the enamel. Another caveat to consider about toothpaste whiteners is that they typically require two to six weeks of application before noticing any changes. The longer-term effects of tooth whitening are achieved through the combination of abrasives that polish the teeth. When shopping for a whitening toothpaste, make sure that it is American Dental Association (ADA) approved, which ensures that it has been tested and determined safe for consumers. However, anything can become dangerous if overused. In this case, it can cause gum and mouth irritation. Over-the-counter whitening strips and trays will allow you to address the deeper stains in the dentin. However, overuse can result in uncomfortable teeth sensitivity to hot and cold temperatures. The most effective way to whiten your teeth is to visit your dentist, discuss your desires, and develop the best plan. 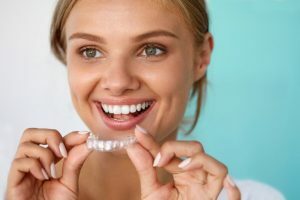 While this is the most intense method of whitening your teeth, it is also the safest because your dentist will be monitoring your progress and making sure that you use the right amount. In working to achieve the look that you’ve always wanted, make sure that you don’t forget about the basics of oral health, which include brushing and flossing twice a day. These practices will help eliminate the harmful bacteria that can cause cavities and deep tooth staining. Finally, if you have more questions about tooth whitening, ask your dentist at your next appointment for a cleaning and examination. Together, the two of you can work to develop the right strategy, so that you can get the smile that even the local news anchors will envy. Dr. Larry C. Young received his Bachelor of Science degree from Clemson University in 1969. He then went on to attend Georgetown University School of Dentistry, earning his Doctor of Dental Surgery degree in 1973. He specializes in general, cosmetic and restorative dentistry, and practices at Larry Young Dental. Dr. Young can be reached for more information through his website. Comments Off on Teeth Whitening Products Put to the Test. Did They Work?